Mawaru Penguindrum, the birth child of the mastermind Kunihiko Ikuhara, is a complex series to say the least. Often times, more is actually happening than what is shown on screen or even spoken about. Even with one viewing of the whole series, it’s understandable to be confused about what you’ve just seen. Personally, I had to watch the series twice before I felt ready to even attempt to pick apart the series. That being said, Mawaru Penguindrum holds up to be one of my favorite anime series of all time, perhaps just for the complexity it guises underneath layers of primary colors and outrageous scenarios. It’s a series that requires a person to input some thought and effort in order to get anything out of the experience. This is why I’m starting a series of posts in which I’ll attempt to deconstruct the plot and hopefully shed some light on the series. Please note that there will be spoilers for the series. First, I’ll try to lay out the “basic” plot of the Mawaru Penguindrum. The title translates to “spinning Penguindrum” and refers to the apple that is constantly being shared amongst the Takakura “siblings.” I don’t believe it’s ever explicitly stated why it’s called the “Penguindrum,” but I interpret it as representing the beating heart, like a drum (more on this topic in future articles). It’s an artifact, taking the form of an apple, that is presented by some unknown force (God, fate, karma, call it what you will) with the power to save just one life. Both on the verge of death as children, Kanba Takakura was the one chosen to live while Shouma was chosen to die. However, Kanba shares half of the apple in order to save them both, but this means that the two of them live out half lives at this point. This is the first split of the Penguindrum and isn’t revealed until the last episode. The series flashes back and forth, shedding light on the lives of the Takakuras and how they encountered each other. Shouma saves Himari from the Child Broiler by splitting his half into two quarters. Jumping back to the first episode of the series, Himari is killed as punishment for the terrorism caused by their parents 16 years ago. Kanba initiates the “Survival Strategy” and saves her by giving him a half of his half. However, fate is out to get Himari and kills her again in episode 12. Kanba begs Sanetoshi to save Himari, but can only do so with the temporary use of medicine. In order to protect Himari, Shouma orders her to move out of the house in episode 21. She returns the piece she received from him before she leaves, perhaps even knowing that she doesn’t have much longer to live. In the final episode, Shouma and Himari return all the pieces to Kanba, which he then uses to save Himari for the last time. Shouma also accepts the punishment for when Ringo uses the diary to change fate by sacrificing himself. 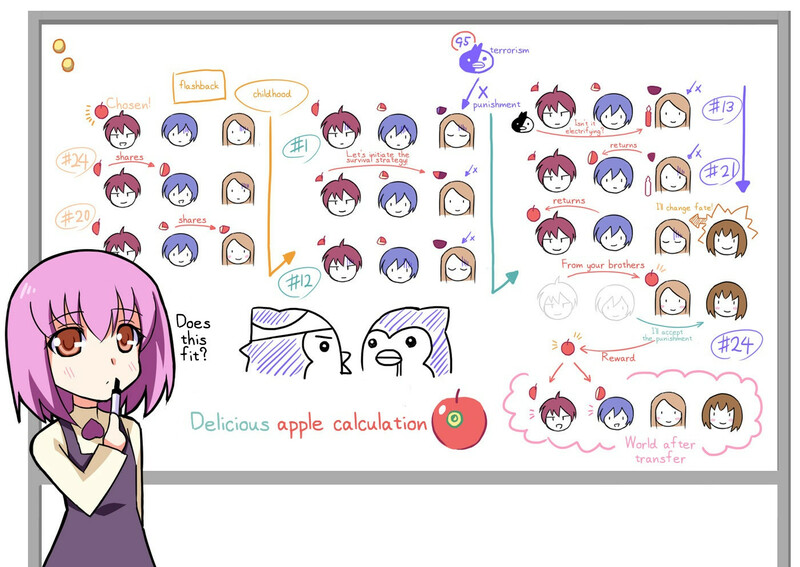 A simplified version of the fruit sharing would be to say Kanba first shares with Shouma, Shouma then shares with Himari at the Child Broiler, and then Himari returns it in the final episode, thereby completing a full cycle for the eponymous “mawaru Penguindrum” (回るピングドラム). It’s interesting to note that 「回る」or「まわる」, “mawaru,” meaning “to spin or rotate,” is different from the word used in the actual title of the series: 「輪る」, which has the kanji that means “wheel.” A quick Google search reveals that the usage of「輪る」in this way is unique to this series. The ending of the series is very open-ended in terms of how it could interpreted. Sanetoshi tells the brothers that they will die without leaving a single trace of themselves, which is not true at all. Himari and Ringo are found on the train with cuts and burns, and Himari also finds the note in the bear from them as well. We also see them walking outside the house as children. However, I think the biggest hint that they are indeed alive is the fact that their penguins are still alive, too. If they were dead, then the penguins would have faded away. This picture diagram seems to imply that the actions from each brother rewarded them both with another Penguindrum to share between them, which is back where they started. Maybe they both got their own Penguindrum? That’s it for the basic plot outline and how the Penguindrum was shared between Kanba, Shouma, and Himari. If you think I got something wrong or if you have a different interpretation, I’d love to hear it. Check out part II, where I discuss the significance of the penguins! Also, check out the unofficial part III where I discuss how Mawaru Penguindrum acts as a response to the 3-stage Tohoku disaster that occurred on 3/11/11, in the middle of the anime’s production. u made everything so much cIearer! Thanks! OMG thank you, I was so freaking mind blown and depressed and confused that I had no idea what was going on and while I still 1. don’t understand why they were dieing 2. don’t get exactly how they came to be family/have parents that are apparently fanatic terrorists despite their appearance and action prior 3. who that ghost jerk is 4. why momoka has a magic book 4. pretty much everything else, this helps it be so much better. This writeup was pretty good, but just made it even more clear that I need to rewatch the show to have any idea what happened. well i have one question whats the deal with momoka and sanetoshi and that fate diary, are they irrelevant to the story and are just there to make the story more understandable and help the pingiundrum to spin and be passed on to himari. or is there some other meaning over these characters and the fate diary. I’ve returned to your post several times over the years because it reminds me of why I love this work, and you’ve done an amazing job putting into words the many layers it has! Thank you so much. That’s how it is!